I love going shopping for a new diary each year. I can spend ages scouring my favourite stores looking at all the different styles and designs trying to decide which to choose. Alongside putting all my important dates, meetings and appointments in my phone I like to have them in my paper diary too incase my phone dies. I'm a little obsessed with making lists (you should see the amount of Christmas based lists currently in the notes section on my phone!) but I also love desk planners and list pads so you can see what you've got to do that day and tick it off as you go along. Kate Spade have some gorgeous stationery (along with pretty much everything else they sell!) and this organiser is ideal for keeping everything in check. It includes sections for you to list each month's celebrations so you don't forget anyone's birthday. I love the stylish white and gold design.Busy B are one of my go to brands for stationary. 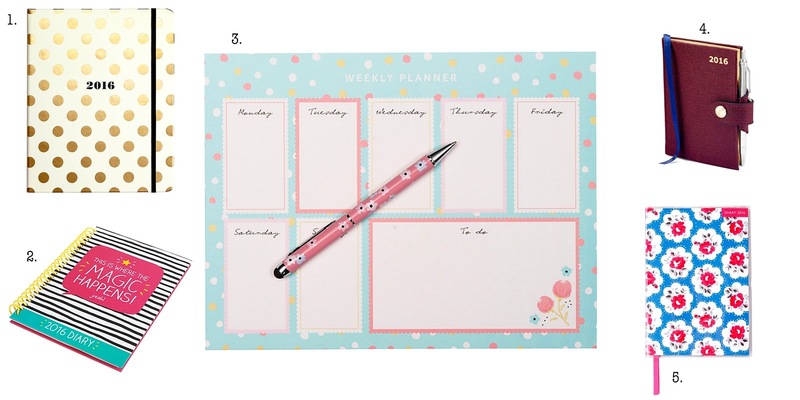 They have so many great products to help you stay organised in cute and quirky patterns. The weekly planner pad is a must buy each year for me. You can list what you have on each day and there's a handy to-do section for each week too. If you're looking to spend a little more this mini pocket leather diary from Aspinal of London comes in a variety of colours. It features a week to view layout and has a handy pen attached. You can even get it personalised for free with your initials. Have you got your diary for next year yet?